So many people had referred to Yosemite National Park as a church or cathedral that the first time I ever rolled into the valley, I swear I heard angels singing. Opening the covers of A Sense of Yosemite is about as close as you can get to that same experience in print. The billing of David “Mas” Masumoto as an essayist in this book set high expectations for me. Masumoto is one of the most important writers of the Japanese-American experience in the U.S. He is a third-generation organic farmer who grows peaches, nectarines, grapes and raisins in California’s Central Valley, literally in the shadow of Yosemite and the Sierra Nevada. And his short, one-page or less essays appropriately discuss taking in Yosemite and its nature through the various senses. Yosemite literally is home for photographer Nancy Robbins, who 12 years ago moved within its boundaries, in Wawona, and whose work really elevates Sense of Yosemite to a near-religious experience. Though Yosemite has been the scene of countless classic images by the likes of Ansel Adams and his ilk, Robbins manages to bring a fresh and creative viewpoint to the park. Her vision ranges from a brooding portrayal of Tunnel View, to her colorfully surprising take on stormy Glacier Point, to one of my favorites – her simple but poignant portrait of Half Dome and North Dome through an ice-crystal-flecked windshield. 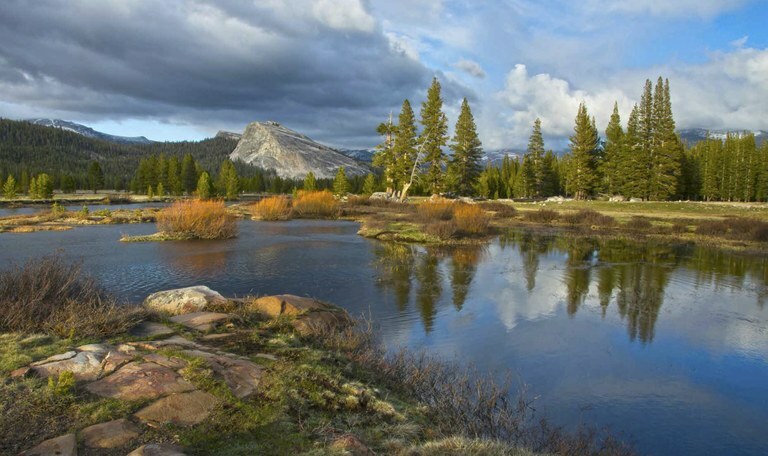 Photo © Nancy Robbins, from A Sense of Yosemite, published by Yosemite Conservancy, www.yosemiteconservancy.org. This photo cannot be reproduced without permission from the publisher. Robbins used her proximity to park features to freeze moments in Yosemite history in artistic splendor. In 2014, the Meadow Fire blazed near Half Dome and forced the evacuation by helicopter of dozens of hikers and tourists. Instead of Armaggedon, Robbins’ recreation transforms the flaming mayhem into a communal campfire moment. Though well-known for her in-park portraits, which she calls “peoplescapes,” Robbins stays in this book with Yosemite’s landscapes and the park’s non-human inhabitants. Robbins not only sees the light, as a resident she sees it as it transforms scenes throughout the season, including the brief collision of fall and winter that she dubs, “Flinter.” During this fifth season, she finds both snowflakes and yellow leaves clinging to the branches of a black oak. 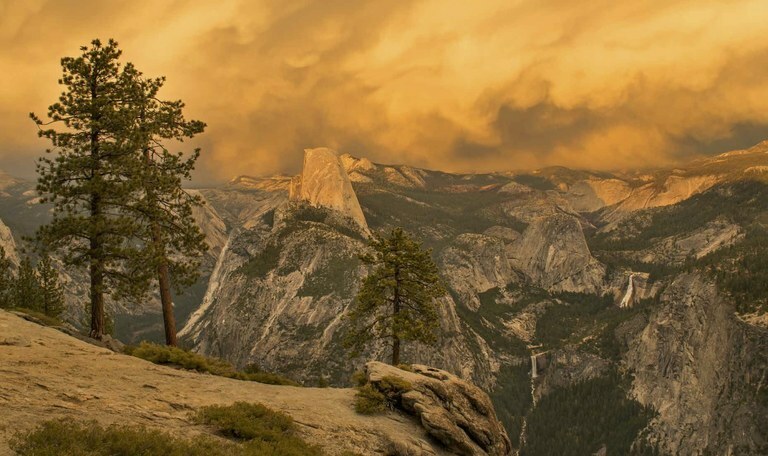 That Robbins also is credited on the cover for her captions is neither mistake nor hyperbole by the Yosemite Conservancy, which published this work and is one of the largest and finest of the friends groups that support national parks around the country. Her captions cross the boundary of perfunctory description into the realm of emotion and poetic reflection, and are an essential feature of the package that includes her photos and Masumoto’s writings. Near the beginning of A Sense of Yosemite is a full-page, black-and-white portrait of an old oak tree in a meadow near Royal Arches, a cliff just below North Dome. Robbins calls it a symbol of life in the park. “… I’ve returned to the oak many times, season after season,” she writes. “As its branches fell, one by one, it kept offering me something new to photograph. Time was taking its toll, yet new leaves burst forth each year.” Alas, the tree succumbed in 2015. That very duality, the timeless renderings of Yosemite’s impermanence, is what drives this offering from two people whose lives and work literally are rooted in their subject matter. Contributing editor Glenn Nelson is the founder of The Trail Posse, which documents and encourages diversity and inclusion in the outdoors.